The links above to navigate to more information about this product below! The JM-4004P is a 17 piece Power Jack Kit that includes a heavy duty carrying case. 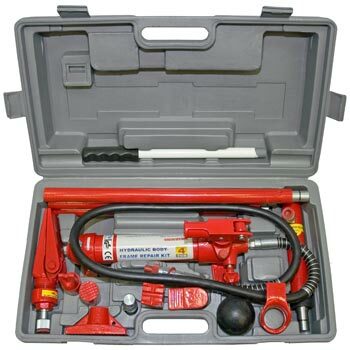 This Power Jack Kit is perfect for automotive body & frame repair. There is also a 10 TON version of this product available that features a rolling case, more info on the JM-4010PW is here. The JM-4004P's weight is just under 51 LBS. If you have any questions regarding shipping procedures or would like more information on this equipment, PLEASE CALL US AT 1-888-736-5094! Call Us For A Shipping Quote! For more information about how this item will be shipped to you, it is always best if you call us at 1-888-736-5094 to get a shipping quote and review Complete Hydraulic's shipping procedure for this Shop Equipment with one of our sales associates. * Unless the customer is tax exempt - A TAX EXEMPT FORM MUST BE PROVIDED! For more thorough overview of CHSSI's shipping policies, click here. Complete Hydraulic Service & Sales, Your #1 Hydraulic Source!